Welcome to the first installment of Cooking My Books. 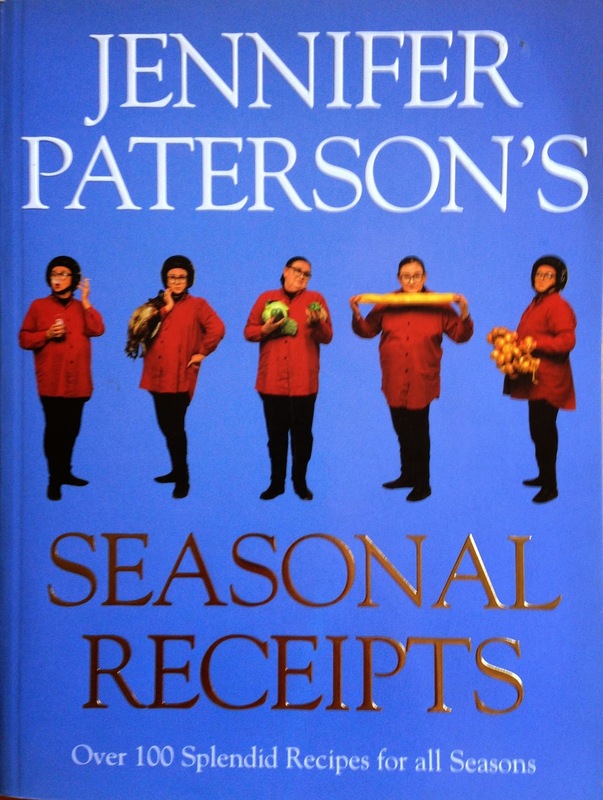 I really didn't know where to start so I chose a book that featured recipes to celebrate summer fruits - Jennifer Paterson's Seasonal Receipts. I've always loved watching cooking shows. It started with PBS watching Yan Can Cook, Julia Child, and The Galloping Gourmet when you had to buy the cookbook or write away for the recipes featured on each show. Now with the Internet I have easy access to recipes and even full-length versions of programs if I miss them when they air. In the early days of the Food Network one of my favorite programs was Two Fat Ladies, the BBC import featuring Jennifer Paterson and Clarissa Dickson Wright. The Anglophile in me loved the different locales and British-based dishes as well as the humor of the two hosts. I often find cookbooks in used bookstores or on discount racks. Often times they have one-off copies of cookbooks I haven't heard of or imports not generally found in this country. I found this cookbook in a used bookstore and was drawn to the author's name. And after the initial read, the book has sat on my bookshelf. White peaches are soaked in a simple syrup infused with red current juice. I started calling this method "cold poaching" because the peaches are simply halved with the pit removed and then they sit overnight in the "poaching" syrup. That's really it. I ate the peaches for dessert with a scoop of homemade limoncello gelato and then for breakfast cut up on top of Greek yogurt. So fresh and delicious either way, perfect for hot summer days. And I didn't throw away the syrup. After soaking overnight the syrup was enhanced with the flavor of the peaches. I used it as a base and mixed it with seltzer water - delicious.